After the death of Joshua, there was no clear prominent successor like he was to Moses. Israel entered a period of time known as the days of the Judges, where God raised judges to lead and save the Israelites. God was with the Israelites as they battled their way into the promised land, yet upon the death of Joshua and his peers, all it took was the transition of a single generation for the Israelites to forget the Lord and what the Lord had done for them. How scary. When God told them to clear the land of the Canaanites, many tribes failed to do so, either enslaving the Canaanites or coexisting with them. Eventually, this led to interaction, influence and intermarrying. The culture and religion of the Canaanites spread and entered the lives of the Israelites. With Asherah poles and altars for Baal, the Israelites turned away from God. In today’s study we will examine why it was so easy for the Israelites to forget the Lord, and the role of parents in ensuring that their next generation will not ever claim not to know the Lord. After that whole generation had been gathered to their ancestors – it would be the generation of people who entered the promised land with Joshua. Joshua and Caleb were the only two men of their generation who were allowed to enter the promised land – Not one of you will enter the land I swore with uplifted hand to make your home, except Caleb son of Jephunneh and Joshua son of Nun [Num 14:30]. 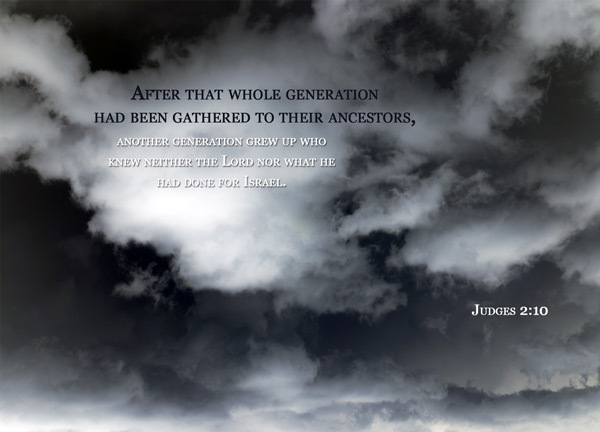 The rest of their generation – those who were above twenty at the count of the census all died out before the Israelites entered the promise land. So it must be this generation of people we are talking about. This generation was too young to grumble against the Lord during the exodus, but they two would have seen some of God’s amazing work on them while they were in the wilderness. They too would remember how the Lord led them into victory at Jericho. They would know of how the Lord delivered them into the promised land, as he had promised he would. another generation grew up who knew neither the Lord nor what he had done for Israel – yet, the next generation did not know. They weren’t born yet, or weren’t old enough when their parents entered the promised land by the grace of the Lord. They wouldn’t know, naturally, unless their parents told them. Of course, how could they know if they were not told? Apparently, they weren’t told, weren’t taught, weren’t adequately reminded of what the Lord had done for them. It’s pretty much like this in modern times: imagine your parents go out somewhere every Sunday. You don’t know where they go, you don’t ask and they never mentioned. Apparently, they go to church, but you never knew that. There are no Bibles or verses or anything that would point to your parents being Christians. They don’t pray before they eat as well, or even if they do, they don’t do it in front of you. Perhaps they have a very amazing testimony of how God worked in their lives when they were younger and how God helped them to pull through some pretty tough times, but they never told you about it, and you never knew God. Eventually, when you grow up, move out, and they die – the chance is lost forever. You won’t know God, you don’t know how God has worked in your family. Parents play a very important role. Surely it is extremely saddening for a parent to hear his or her child say that he does not know the Lord, and he does not know what the Lord has done for his parents. Parenting is probably not black and white, and however hard you try to talk to your children about God, however much you try to teach them about God, they may still walk away from God. Now I’m not the best person to discuss that, but there’s an obvious disparity between teaching them and not teaching them at all. How can they believe if they have not heard? And how can they hear if nobody was sent to preach to them? In Chinese there’s a saying that wealth cannot last beyond 3 generations, implying that by the third generation all the money that was earned by the first generation would have been squandered, as the third generation would not have seen the hard work or experienced the hard life that the first and even the second generation have been through. But it takes lesser than that for any people to forget the Lord. It took the turn of one generation of people for the Israelites to forget God. That’s kind of sad, especially when you consider the fact that the Israeli culture, language and people survived through almost 2000 years even without a homeland. How many generations had passed, but they didn’t forget their language or their culture. Yet all it took to forget God back then was just one generation. Do not assume that just because you are a Christian, your children would be too. It doesn’t take that much for a line of Christians to be broken.